Judge Tosses Kansas' Proof-Of-Citizenship Voter Law And Rebukes Sec. Of State Kobach Kansas had one of the strictest voter registration laws in the U.S. But a federal judge says it's unconstitutional — and she is requiring Kris Kobach to take legal classes to brush up on the rules. 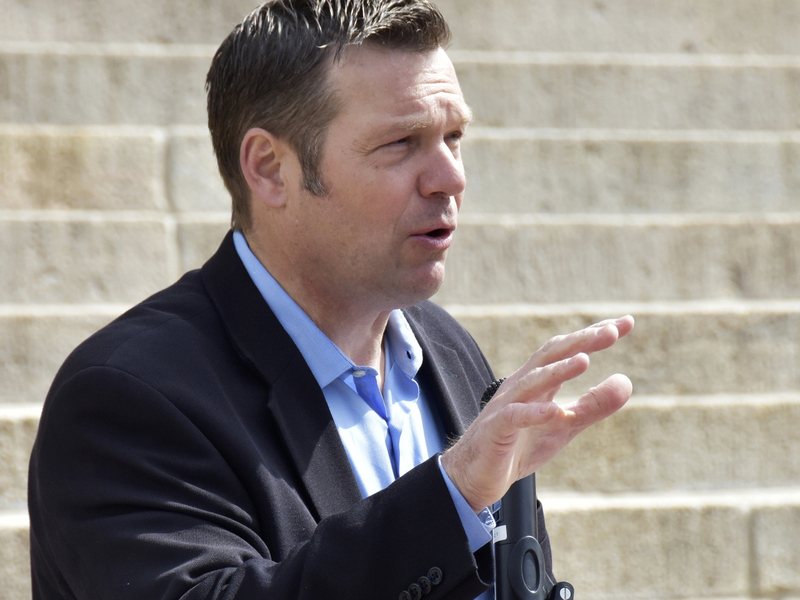 A federal judge says that Kansas' strict voter registration law is unconstitutional — and she also criticized Kansas Secretary of State Kris Kobach, who represented his office in defending the law. Kansas cannot require people to prove their U.S. citizenship before they can vote, a federal judge says, ruling that the state's election law is unconstitutional. The judge sharply criticized Kansas Secretary of State Kris Kobach, who has based much of his political career on worries about voter fraud. Chief District Judge Julie A. Robinson sanctioned Kobach — who led President Trump's voter fraud commission — by ordering him to take a legal class on the rules of evidence or procedure. Kobach represented his office and was the lead attorney in the case. The judge said Kobach failed to show there had been a "substantial number" of people who managed to register to vote in Kansas without being U.S. citizens. Starting in 2013, people who wanted to vote in Kansas needed to produce documents proving their U.S. citizenship, such as a driver's license, birth certificate, naturalization papers, a passport. Robinson said that law violated the National Voter Registration Act and the 14th Amendment, in a 118-page ruling that decided two consolidated cases. Kansas had already required voters to be U.S. citizens — but before 2013, people were able to satisfy that rule by affirming their eligibility on their registration application. Kobach was a driving force behind the change. The trial, which concluded in March, was his chance to show it was based on real concerns and would protect elections in Kansas from fraud. Heading into the trial, Kobach said that since 1999, his office had confirmed 127 cases of noncitizens who had either registered to vote or attempted to do so. Of that number, 43 had succeeded in registering and 11 had voted. Those figures were just "the tip of the iceberg," Kobach had vowed. But after reviewing the state's evidence and hearing from its experts, Robinson concluded that "there is no iceberg; only an icicle, largely created by confusion and administrative error." Robinson noted that Kansas is a state with some 1.8 million registered voters — and that the number of people in Kansas who aren't U.S. citizens who either registered to vote or tried to do so is 0.6 percent of the state's noncitizen population. Based on the evidence, the judge ruled, Kansas' interests in preventing fraud, while legitimate, are "not strong enough to outweigh the tangible and quantifiable burden on eligible voter registration applicants in Kansas who were not registered to vote before January 1, 2013." The new law also complicated the process for "motor voter" applicants, who might not have brought the proper citizenship documents when they applied for or renewed a driver's license. Kansas drivers are required to provide proof of lawful presence when they apply for their first license. As the judge wrote in her ruling, "Of the 30,732 applicants whose applications were, as of March 31, 2016, suspended or canceled due to failure to provide [documentation], approximately 75 percent were motor-voter applicants." The American Civil Liberties Union led the legal challenge to the Kansas law. "That law was based on a xenophobic lie that noncitizens are engaged in rampant election fraud," said Dale Ho, director of the ACLU's Voting Rights Project. "The court found that there is 'no credible evidence' for that falsehood and correctly ruled that Kobach's documentary proof-of-citizenship requirement violates federal law and the U.S. Constitution." During the trial, Kobach "denied allegations of voter suppression and put experts on the stand to present polls and surveys that they say show almost all Kansans have easy access to documents like birth certificates," as Celia Llopis-Jepsen of the Kansas News Service reported for NPR. The plaintiffs included the League of Women Voters of Kansas, which said it had struggled to help young voters register because of the new law. Some applicants were unable or unwilling to show their papers to a volunteer, the league said. Others balked at the time investment, after the process went from taking less than five minutes to requiring a full hour. The organization also said it was forced to halt nearly all of its operations so it could change its protocols. The main concern: that volunteers might somehow be found liable if they handled or copied applicants' citizenship documents and other records. For instance, a voter registration drive at Washburn University yielded 400 voter applicants — but most were incomplete and, after weeks of effort, only around 75 voters were registered. The evidence, Robinson wrote, backed up an expert's opinion that Kansas' law "disproportionately affects the young and those who are not politically affiliated." Another issue: Before the league could help would-be voters finish the registration process, it had to buy the "suspense list" from the secretary of state's office – something it did several times. It also purchased the full list of voters, to verify who was on it. In sanctioning Kobach, the judge gave the secretary of state roughly one year to provide proof of the additional training, which would be part of the mandatory continuing legal education classes that many attorneys take to maintain their law licenses. Robinson cited "a pattern and practice by [Kobach of flouting] disclosure and discovery rules that are designed to prevent prejudice and surprise at trial. It's unclear, she said, whether he "repeatedly failed to meet his disclosure obligations intentionally or due to his unfamiliarity with the federal rules." Kobach, we'll note, is a Harvard graduate who earned his law degree at Yale and was a law clerk at the U.S. Court of Appeals for the 10th Circuit. He also taught constitutional law as a professor at the University of Missouri, Kansas City, according to his official biography. The ruling comes two months after the judge found Kobach in contempt of court for disobeying her order to allow some potentially ineligible voters to remain eligible to cast a ballot under a preliminary injunction. Kobach is running for governor in Kansas' current election season, locked in a tight Republican primary race against incumbent Gov. Jeff Colyer — who rose to the office after former Gov. Sam Brownback won confirmation as the U.S. ambassador-at-large for international religious freedom.